IBM calls Watson “a cognitive application platform”. Cognitive computing aims to solve complex and ambiguous problems. This approach needs interaction with the human and has to be context-aware. IBM is investing $1 billion in business unit for Watson. The goal is to build an ecosystem around it. Watson website is surprising when comparing to IBM corporate site. The product gives the impression of a startup company, even demos and their source code are available in GitHub. To enhance the ecosystem, IBM has purchased analytics companies to be included in Watson portfolio. A recent acquisition is AlchemyAPI which provides tools for advanced text mining and computer vision. IBM also announced a closer partnership with Twitter to provide better access to tweets from within Watson platform. Alchemy Language analyzes text and attempts for example to identify the language from the given text. Visual Recognition analyzes images and videos to understand the visual content without textual descriptions. Personality Insights attempts to identify personality characteristics from the given text, including tweets. Tradeoff Analytics provides help and visualization tools to meet even conflicting goals, for example which mortgage to take. Watson also supports third-party services like Cognitive Graph provided by Cognitive Scale. Watson Analytics provides out-of-the-box visualizations and allows user to build infographics from the analytics results to tell the data story. It’s a tool for self-service analytics providing also lightweight predictive analytics. What Is the State of Watson Ecosystem Now? Watson ecosystem is growing fast. New services and APIs are constantly being added to the portfolio. As most of them are in beta phase, pricing is not yet available for all services. Each Watson service has its own pricing model. Pricing models vary, eg. Personality Insights are priced per API call. If the expected usage is not known in advance, billing might cause unexpected surprises. Privacy requirements needs to be verified. For instance, Watson Analytics is not certified for safe harbor as required by EU privacy regulation (as of March 2015). 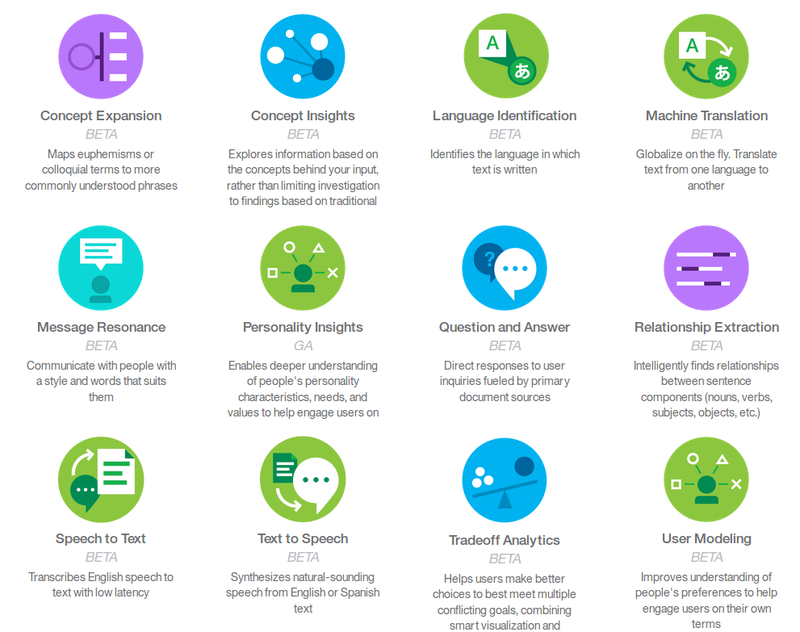 Watson uses heavily text analysis as part of the advanced analytics services. Make sure that your language choices are supported by the intended services. What Will Be the Future of Watson? We are still at beginning of this phenomenon called cognitive computing. Services can be combined to create cutting-edge applications that could alter everyday life. Startups are already taking advantage of Watson ecosystem. WayBlazer will produce a cognitive travel graph which helps to find travel destinations according to customer’s preferences. IBM has created a promising analytics ecosystem. Watson Analytics and services are just a tip of the iceberg on top of this growing ecosystem for cognitive computing. ← Mitä Ylen vaalikone kertoo sosiaalisen median käytöstä vuonna 2015?